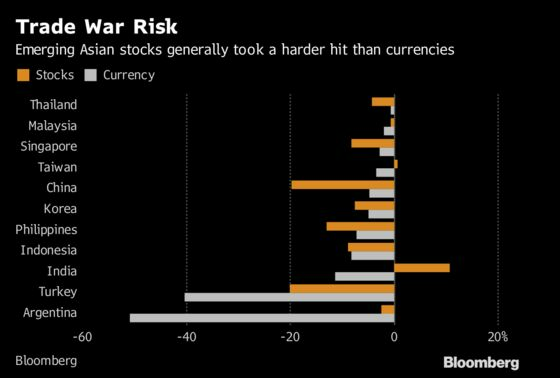 (Bloomberg) -- The fact that most emerging Asian currencies have held up against the onslaught of risk-off sentiment this year doesn’t mean their stock markets are showing the same resilience. Many Asia stock markets have led declines, dropping more than Argentina and Turkey, even as their currencies outperform amid a worldwide slump triggered by Federal Reserve tightening and debt concerns. Worries about the escalating trade war and its potential impact on China’s economic growth have had a bigger impact on Asian equity markets than the region’s currencies, Capital Economics strategist Oliver Jones said in a report. The worst isn’t over for markets such as Indonesia or South Korea, he added. "Equities in the region might continue to do worse than their peers this year, as China’s economy loses more momentum and the trade war rumbles on," Jones said. That under-performance won’t end until 2019, when China’s economic growth stabilizes. India is an exception. Its currency has fallen more than others in Asia on concern it will have to pay more to finance a large current account deficit as U.S. borrowing costs rise, while the prospect of robust growth has underpinned stocks at the same time.